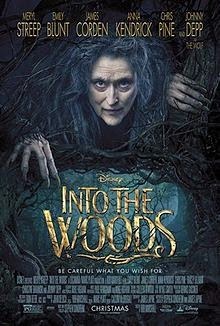 Into the Woods is a 2014 American musical fantasy film directed by Rob Marshall, and adapted to the screen by James Lapine from his and Stephen Sondheim‘s Tony Award–winning Broadway musical of the same name. Inspired by the Grimm Brothers‘ fairy tales of “Little Red Riding Hood“, “Cinderella“, “Jack and the Beanstalk“, and “Rapunzel“, the film is a fantasy genre crossover centered on a childless couple, who set out to end a curse placed on them by a vengeful witch. Ultimately though, the characters are forced to rectify the consequences of their actions. I wish… I wish… I wish for a movie that has lots of singing, dark plot and fairy tales. I have to say, this movie was different than I thought it would be, I went in knowing it was a musical, yet there is a lot more singing than I thought. This, however is not necessary a bad thing but should be taken as note when going in to watch. There is ALOT of fairy tales all intertwined in this movie and not all are names, yet you will know them from the distinctive characteristics, even if they look different. We have the Baker and his wife, Jack, Cinderella, Red Riding Hood… and so on and so forth who’s stories are all brought together by the Witch’s curse. The Witch, played by Meryl Streep is equal parts crazy and insane. She is strong, powerful and wants to break her mothers curse. A complicated and deep character, Streep’s strong voice and emotional singing lends to the character and makes the viewer watch in awe of her plights. The Baker and his wife: James Corden and Emily Blunt, tie the whole story together with their plight for a child and the journey they have to take to have one. Emily Blunt in particular, while singing offered an insight into her character’s feelings from happiness, despair to confusion. We then have Anna Kendrick as Cinderella, who’s story is entwined with Prince Charming and the story of going to the festival without her mother or stepsisters knowing. The costumes were that of a more medieval time, yet had some modern eccentrics that are most notable in Cinderella’s stepsisters. The set was beautifully dark and gloomy, an inkling of the tone the movie will take and just how this differs from a classic Disney movie. The cinematography was complete in long angles and close ups, allowing for the scope of woods to be felt as well as the emotions coming from the characters. the whole, cringe-worthiness of the scene. You will have to watch it to know what I mean. So will there be a happily ever after in the woods?